Lexiaguo (Luoxiagou) – where is it in China? 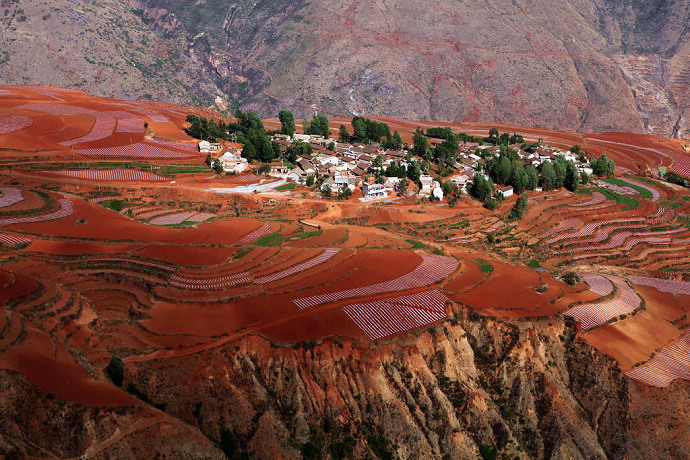 It is located in the south-western part of Kunming , 2600 ft. above sea level, a remote area. Because of its lack of infrastructure and inadequate transportation and lodging, most travel agencies would not think of going there. 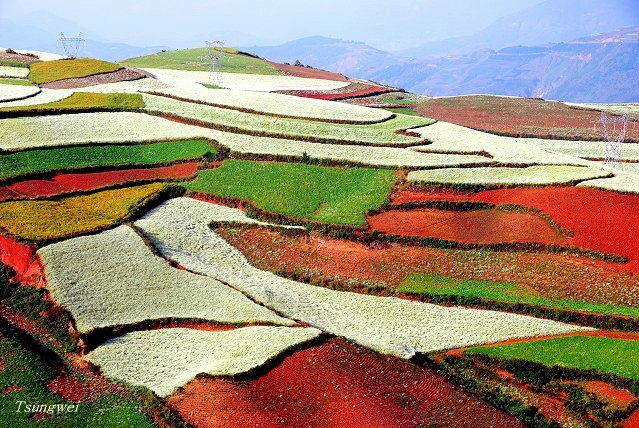 But for those who have seen the pictures of the Red land, no one can resist being attracted to its beautiful scenery. This extra-ordinary reddish brown soil is a result of oxidized iron (and various other oxidized metallic minerals). 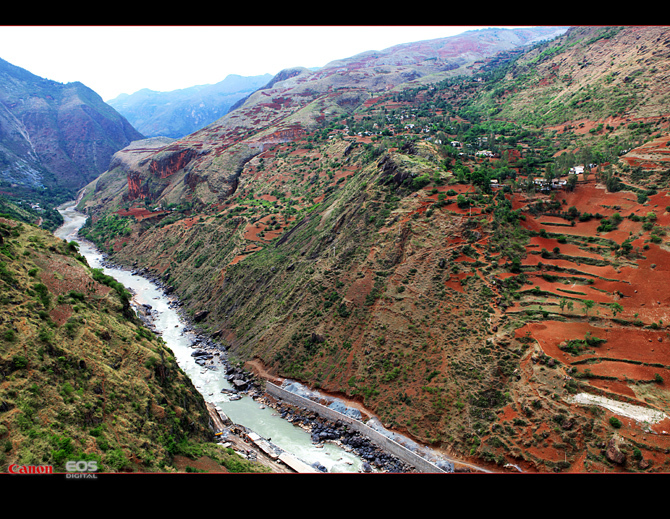 In these mountains and hills every inch of land is cultivated to the maximum causing unwanted damage to the place through erosion that’s why returning to forestry is being advocated. Because each family owns different sizes and shapes of land and each plant its own preference of crops, this beautiful tableau is produced. 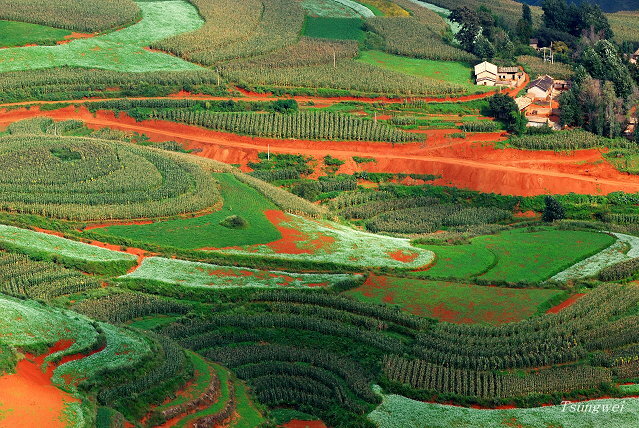 During harvest time, the soil is turned over and exposes this unusually red color. 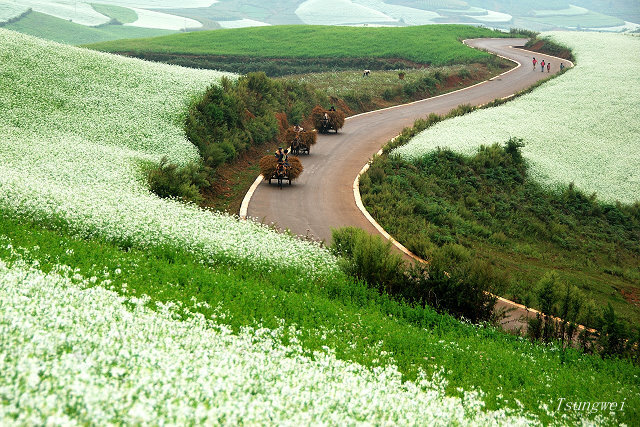 In September, white-coloured oil flowers are in bloom on the whole mountain. It is a pity they cover up the beautiful red color. The best time for sightseeing tour is middle of November. Different seasons, different time, different sunlight produce different colors. 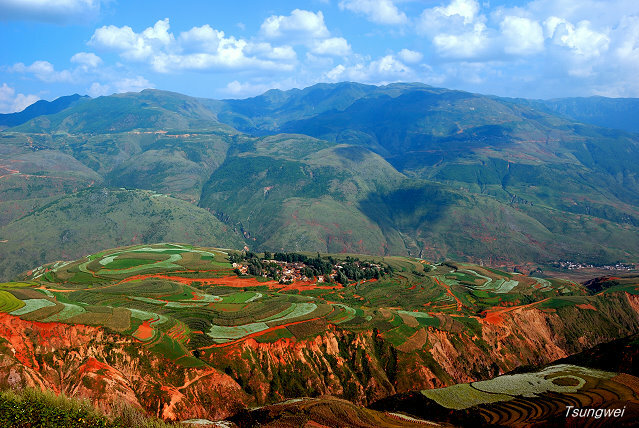 I later found out that the wider known name of this place is called Dongchuan Red Land (东川红土地) in Kunming, Yunnan. 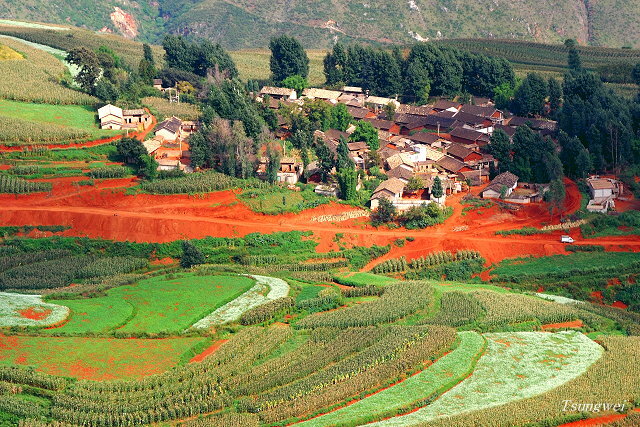 Lexiaguo mentioned in the forwarded email is a small village in the Dongchuan Red Land and the correct pinyin spelling should be Luo Xia Gou or La Xia Gou (落霞沟), literally means a ditch of fallen red colours since it’s situated between two mountains on both sides. Luoxiagou is more widely used. If you type La or Luo on the keyboard with Chinese language setting, you get the option of the same Chinese character. 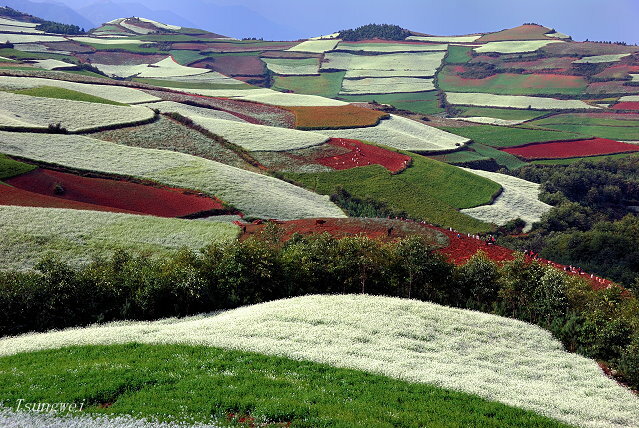 Try typing in Dongchuan Red Land in Google images, you will see many more breath-taking photos. I also found a map with the name of the small villages around that area. I have tried to collage different maps from Google to give everyone an idea of Kunming of Yunnan in relation to Dongchuan and Xintianxiang, where the Dongchuan Red Land fields are located. The map on the left shows location of different villages. You can click to enlarge. 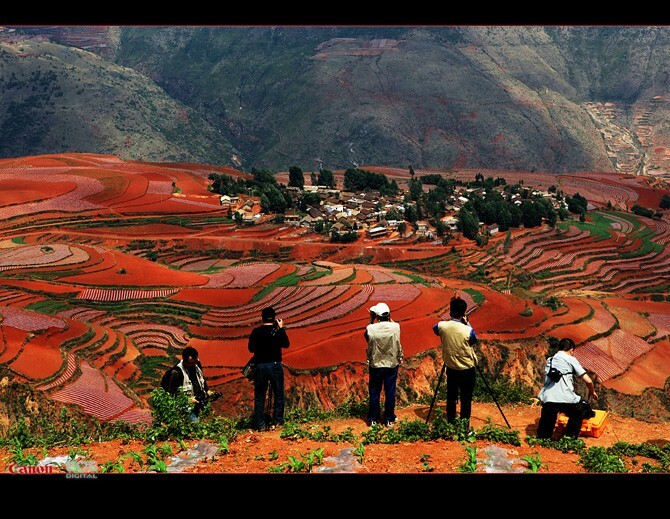 Dongchuan Red Land images. Enjoy the stunning scenery. 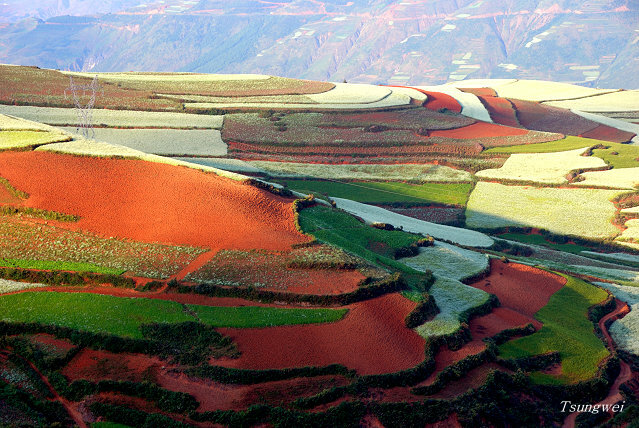 Hi, thanks for your information on China and the “rainbow mountains”. Have you located them on GOOGLE EARTH ? 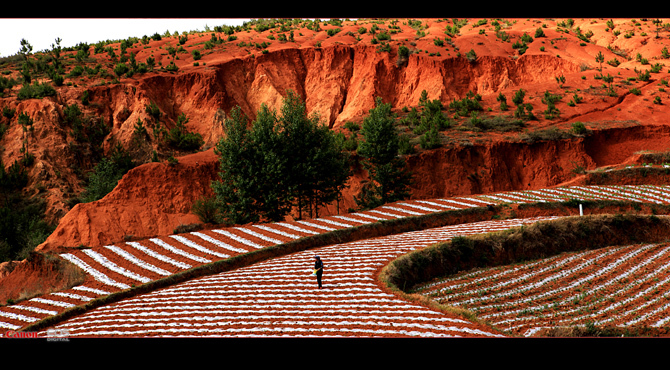 Ibelieve Lexiagou is NE of Kunming, which is in the southwest. 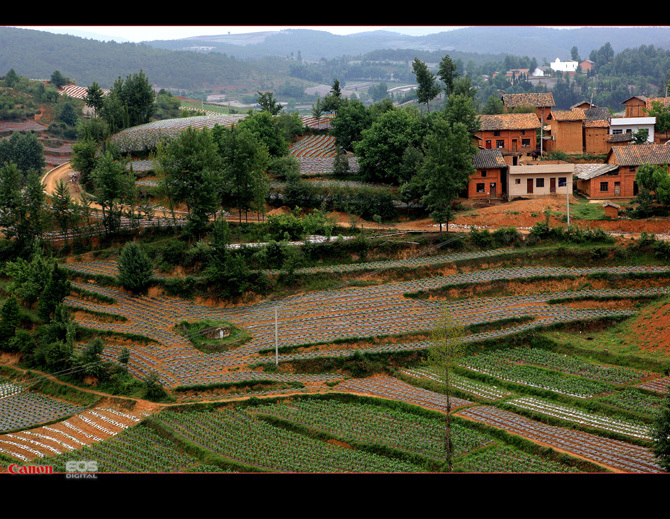 Yet, Lexiagou is labeled as in the SW of Kunming. Check the map! Addendum – Guess ElaineR is disclaiming on the accuracy of such information. That’s not being a good Netizen, IMO. The accuracy of a travel destination’s location is so essential in order NOT to mislead the traveler, who’s often at a loss when in a strange land. Accordingly, I urge ElaineR to correct such false and misleading information. Hi, this has been responded before. Please scroll down to see the comment. Thank you. Early March…will it be coulorful ? November is still the best time to visit in order to see the colours in full bloom. And they say that you have to die to go to paradise. My goodness, this place is absolutelly breathtaking. the colours are absolutelly gorgeous and you just feel like living there. 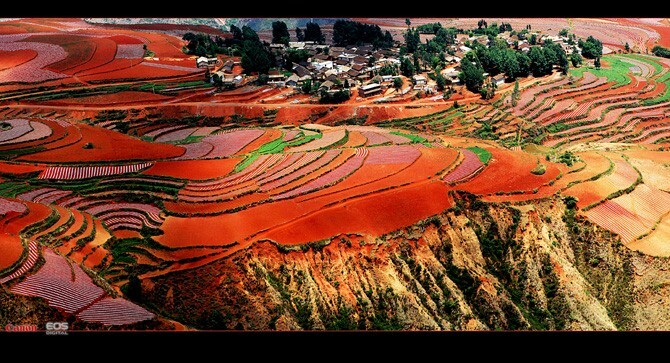 We will be going to Red Land, Dongchuan in April,2013. Would it be as colorful in the month of April ?Is it worth going in April ?? The location I believe is badly mis-quoted. Same problem when I was researching Yuanyang. I would be careful not to mislead others looking for such info. I believe it’s in the Southwest of Yuannan, but North of Kunming….. not southwest of Kunming….. One has to be careful what to post so it doesn’t become misleading? Hi, you are right. 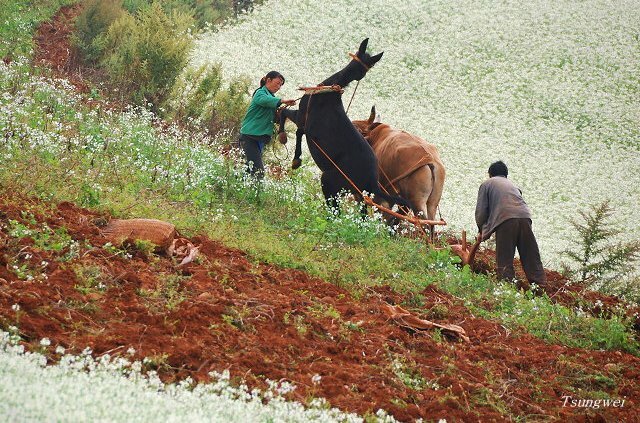 The text mentioning South West of Kunming was the original text that has been circulated on the internet. I posted it up for everyone’s reference. However, the original text is not wrong either. 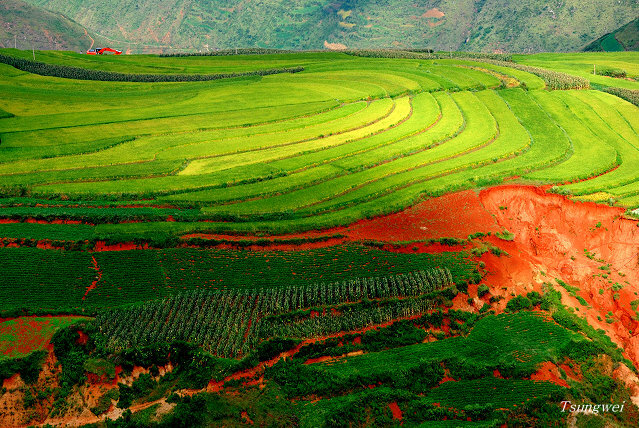 To be clear, Lexiaguo is situated in the South West of Dongchuan District, which is part of Kunming. But it is indeed north (or North East) of Kunming City Centre. Thanks for pointing this out. From the map that I created above, you can work out the exact location. 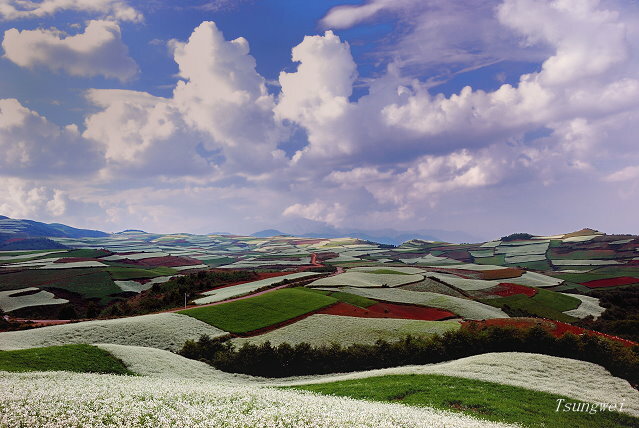 Also, please refer to below information from Wikipedia with regard to the relationship between Dongchuan and Kunming. OK, noted that my earlier comment on the location of Lexiaguo. I think the text of the article needs to be revised so someone not reading these comments is not misled. If I go Lexiaguo in September instead of November, what do I expected to miss ? The colours will not be as striking. I understand that November is the best time to visit Lexiaguo, but I would like to visit Lhasa before or after, therefore I wanted to go on September instead. What can I expect to see or not to see in September compaire to November ? 1. Where can I find information about which language or dialect(s) the people of the Lexiaguo area speak? 2. I am having a difficult time finding more information about this beautiful spot. Hi, it’s Mandarin they are speaking. 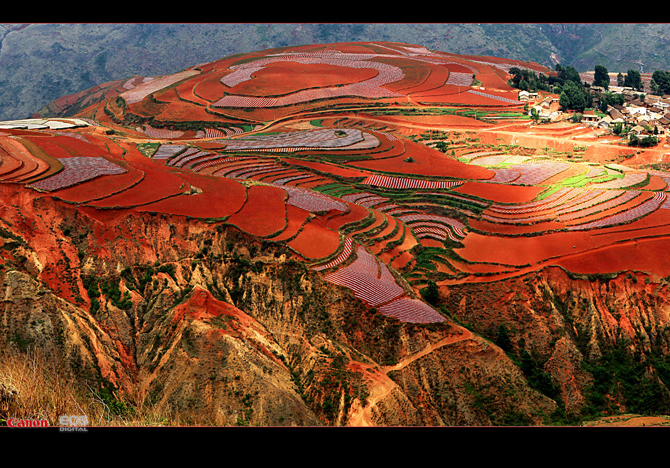 I like a lot everything about China, I’ve just been there once in 2005, but I hope this setember I could gou to Yunnan for 17 days. Though I haven’t been there I already know a lot of things. I like doing pps. and I have 1 about Kunming, 1 Dali,1 Lijiang and 1 with Yunnan in whole. Your web is very interesting. interesting and good info about lexiaguo. only thing that should be clearified i guess is – it is actually NORTH of kunming and not south west. according do your map(s) as well as google-maps. 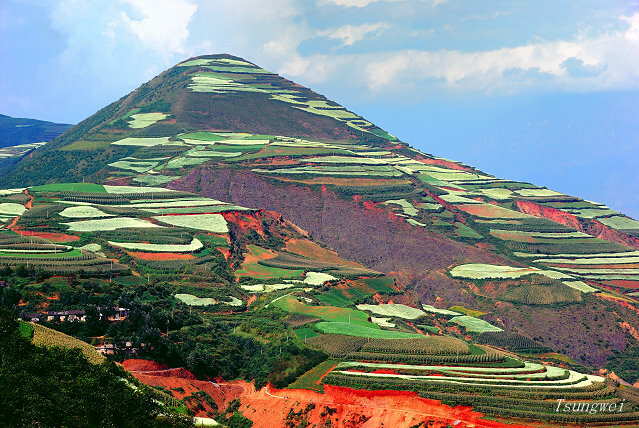 UNLESS this is a different Dongchuan shown on your map. guess it should be south-west china instead of south west of kunming. anyway, thanks for the info about it. You are absolutely right Harry. The original information in the email forwarder was not accurate. Hi, I’m Lebanese, I like the site very much and I’d like to visit it soon.What’s the best way to reach it from Lebanon? Is there any agency that deals with it? Cost? Best time of the year? 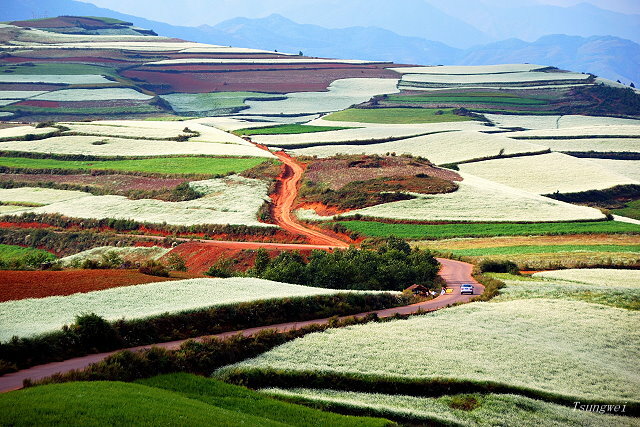 I went there early October, Dongchuan district is around 200 km from Kunming downtown, it takes 3/1/2 to 4 hours drive in which 1/1/2 hours is climbing uphill. 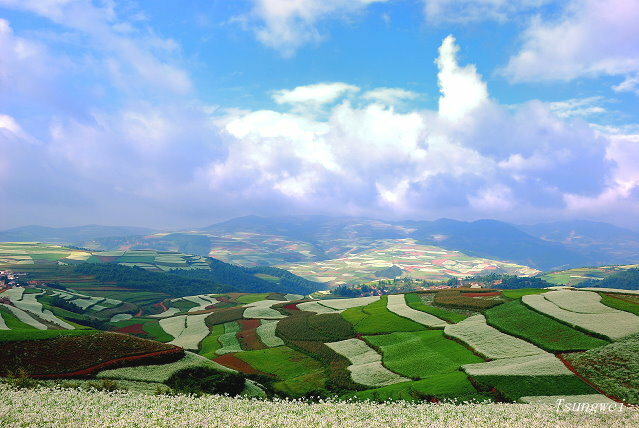 There’s two driving route from Kunming downtown to Dongchuan district, one via highway and the other via the ordinary road. If you go there via highway, you will arrive Lexiagou first; if you take another route, you will arrive Hua Shi Tou first. There are couple of lodges around Hua Shi Tou area, the condition is OK, the one I stayed is RMB60 per room night. If you are not going there during high season, no advance booking is required, however you have to check the hot water supply, some lodges might not have sufficient hot water supply for taking bath. 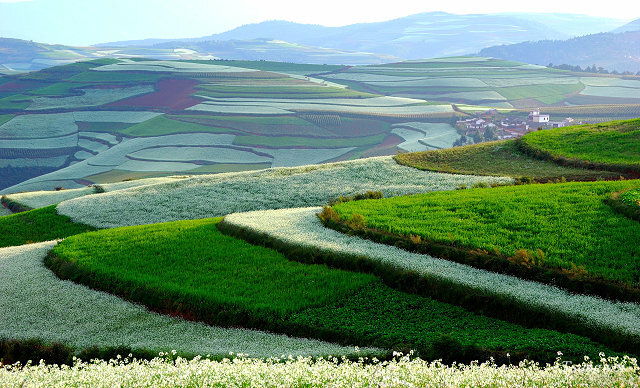 The altitude at Hua Shi Tou is around 2500 km, in Spring and Autumn, the temperature at night sometimes is below 10 degree. 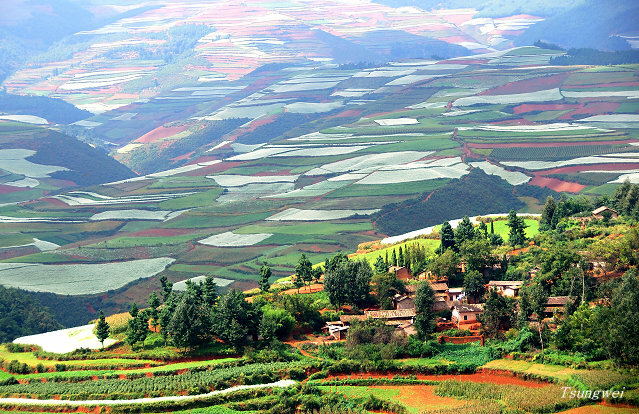 Hiring a car from Kunming to go there is not difficult, the price is around RMB400 – 600 per day, excluding petrol and toll fee. In general, two days in enough. 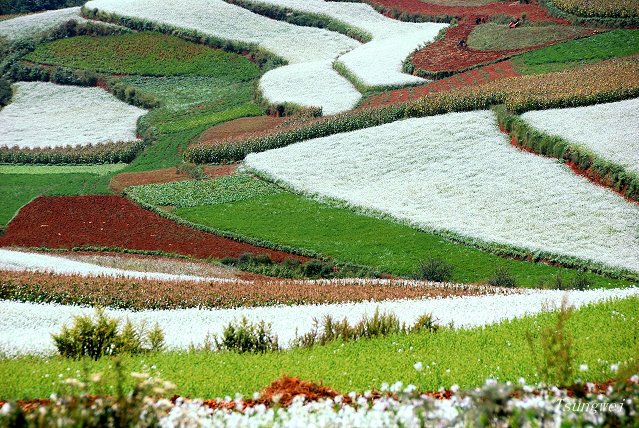 If you leave Kunming early in the morning, you will arrive Hua Shi Tou or Lexiagou between 12 – 1 pm. Lexiagou indeed is a hill top area, a birdeye view of a valley full of terrace field. Spending two hours at Lexiagou should be enough except you want to spend longer time to go down to the valley and take more photos. I personally had spent more time in Hua Shi Tou area, the area is larger and if you want to take more photos, it might take 6 hours. I checked with the villagers, they said that in April & May, that area is full of barley and wheat which is gold in colour. 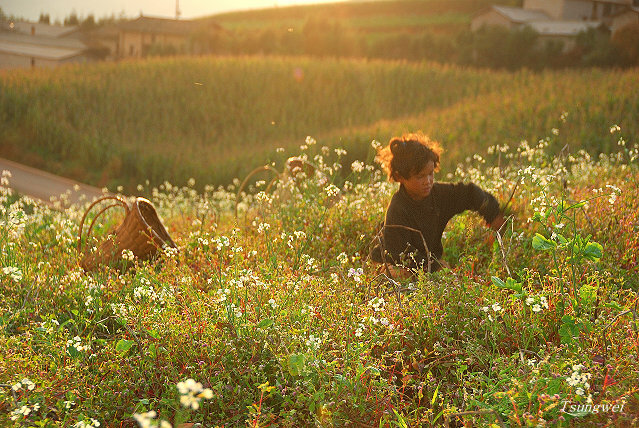 Before mid autumn festival, buckwheat flowers and 油菜花 is bloosming. I am meeting a (US) friend in Chengdu in October and would like to visit Lexiaguo (Luoxiagou). I have not yet seen any info about how to get there, where to stay, and how to get out to the beautiful areas in the vicinity. My friend and I will both have bikes, and can travel reasonably long distances but would like to have some idea of where to begin. Thanks for whatever advice you can provide. Hi Will, the places are very popular among photograhers. There are some small lodges for photographers near the villages. 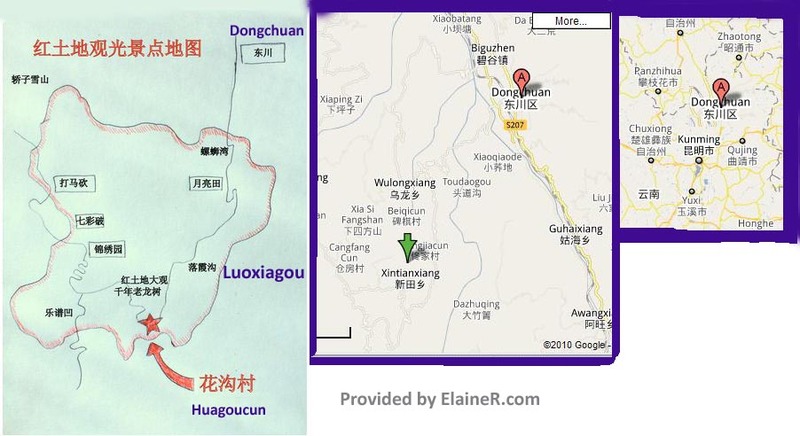 According to some Chinese photographers’ journals that I read, first of all, you need to get yourself from Kunming to Dongchuan, then to Xin Tian Xiang as indicated in the middle section of the map above. In Xintianxiang, look for Hua Shi Tou 花石头社 (there should be a road sign saying: 109 km). 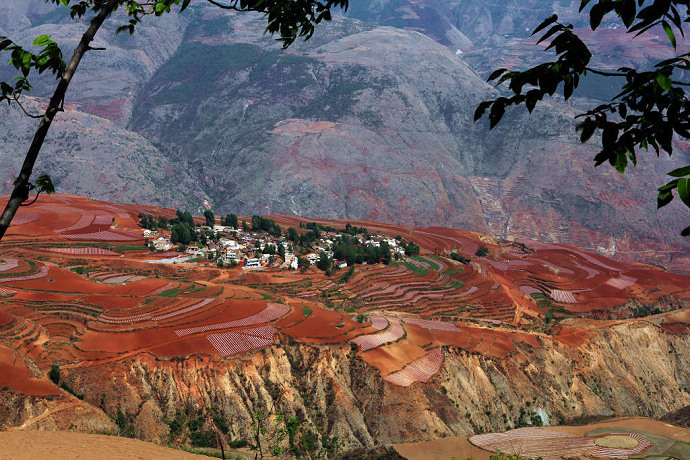 From Hua Shi Tou, there are 15 miles of red land. They are all concentrated here. You can see from the map above that there are many villages in this area. According to those journals, May, September and November are the best months for photographs – different seasons reflect different colours. Originally, I plan to go this month. Now my plan may need to be changed. I have been talking to a couple of local travel agencies to arrange the transportation. I will not go myself even being a Chinese. But then, I have never been a Lonely Planet type of person. If you successfully find your way there, I would love to hear from you and hope you can share your story. Good luck and best. 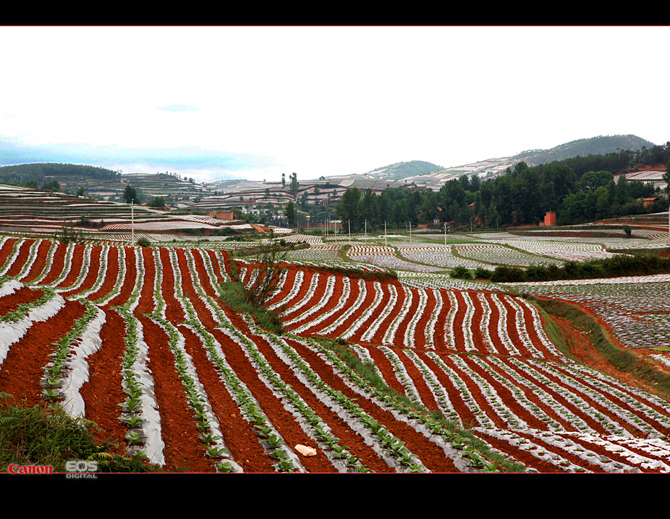 Checked with my friend in Yunnan, the best time to be there is November and December. That is the time you can see the scene shown in the photos you posted. 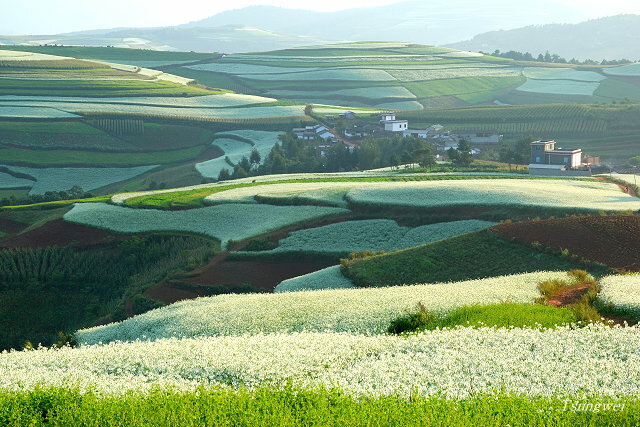 There are travel agents in Hong Kong specialize in organizing tour for photographer, they could bring you to scenic area like Dongchuan, Yuanyang. Sorry I did not get the information on hand, you can try to search it thru internet. I’m portuguese and I’ll like to see this place. how to go? and the best time ? Hi Maria, you probably will need to look into finding a local tour company to help you. 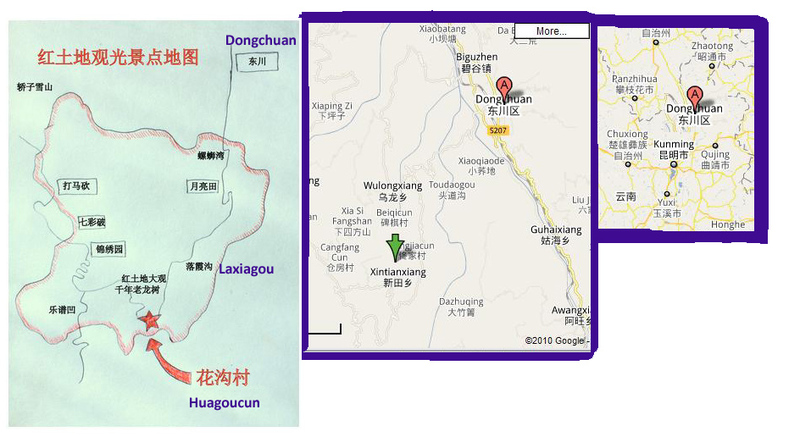 As far as I know, from Kunming city to Dongchuan is over 190 km and from Dongchuan to the Red Land spots are over 100km. There are a lot of mountain roads. I am planning to go there myself very soon (hopefully in Sep) and I will share my experience with all. Thanks. Call your broker or the tour people. They should give you a detailed list of costs. Most will also charge for tips and at the end you are still tipping more of your own or you look bad. Truly awesome! Serene. Makes me think of the God of Creation. I send you a Thanks Blessing. Great info. What’s best way to get there? and when u do, are there sufficient lodgings, etc? Thanks Tom for your comment. I wrote this post totally out of my own curiosity. Since then, it has generated a lot of interests to my site. It’s out of my expectation. Now it gets me even more curious. I hope I can go there very soon. So do subscribe my RSS and I hope I can share with everyone about the journey. Thanks again. Thanks for your comment Carmon. I will appreciate you can attribute the original content back to my site. Or like what Mark does in his blog (http://markschinablog.blogspot.com/search/label/Travel) to extend the content so that everyone can share. I don’t know Mark personally. But I am happy to reference his blog here. If you create more info around this subject, I am happy to do the same. Thanks again. Great read. Thanks for the info! Interesting site. I am so looking forward to reading more. Where to see Lavender in Provence? Zictor Hasman on Lexiaguo (Luoxiagou) – where is it in China? Sammo on Lexiaguo (Luoxiagou) – where is it in China? Where did you have the most memorable holiday?